BitFenix, the case specialist redefines the Mini-ITX form factor with their first cube chassis by the name BitFenix Prodigy. Aptly named, the enclosure reinvents the capabilities of cube enclosures, allowing the uncompromising use of high-end components. The hard facts of the BitFenix Prodigy let every gamer heart beat higher: room for up to nine drives, space for fans with 120 or 140 mm, mounting possibility for a 240 mm radiator and ample room for even the longest graphic cards. On the exterior, the Prodigy utilizes an interesting mix of materials, making it stand out from the competition. 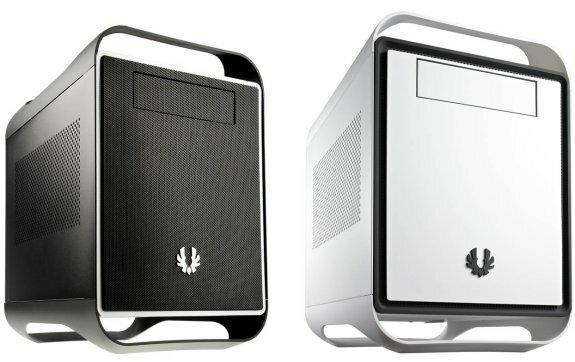 BitFenix proves once more, that round enclosures can be just as timeless as edgy ones, while conveying the identity of the case-specialist, thanks to the unique SofTouch surface, which has been applied to the top and underside of the cube-shaped chassis. These round parts act as grips and feet for the case, making transportation a breeze. This effective design, which incorporates two handles in the top of the compact and light BitFenix Prodify chassis, makes it the perfect choice for LAN Party participants. Constructed out of the special „FyberFlex“ material, which combines both strength and flexibilt, as they can be pushed down without breaking or bending permanently, The actual body of the Prodigy consists of solid steel, with either an all black or all white paint job. From the front, the cube chassis impresses with clean and timeless looks, but a slight difference between the two color versions. While the Prodigy in Midnight Black features a metal mesh front, the Arctic White variant offers a solid panel. The entire I/O of the chassis has been placed on the side of the case, to ensure adequate space for front air cooling. It consists of two USB 3.0 ports and a pair of Audio plugs. Bitfenix has embedded an vent on the left side panel, allowing for fresh air to enter, keeping the internal components cool in every situation. Even with its compact size, one may install up to two 120 mm fans in the front of the BitFenix Prodigy, with one Spectre unit already included. Thanks to additional mounting holes a 230 mm variant may be placed here as well - which is unheard of in a Mini-ITX chassis! To pull hot air out of the BitFenix Prodigy, another 120 mm Spectre fan has been included in the back of the chassis. Alternatively, a 140 mm unit may be installed instead. Two additional spots for 120 mm variants have been cut out in the ceiling of the chassis, with proper spacing for a 240 mm radiator - another first in a Mini-ITX chassis. To aid in the assembly process, the metal mesh cover on top is easily removable. In terms of drive space, there is a single 5.25 inch bay for the latest optical drives and two separate hard drive cages.. These FlexCages may be filled with up to five hard drives, not requiring any tools thanks to the intricately designed drive trays. Additional 2.5“ drives may be installed next to the hard drive cage for a total of ten different bays within the compact BitFenix Prodigy. To keep temperatures down within the enclosure a cordoned off area is intended for a full size ATX power supply. Thanks to a frame in the rear, installing a unit within the Prodigy is always a breeze - even with a system filled with hardware. Thanks to this separation, the BitFenix Prodigy can easily fit tower coolers usually only reserved for mid- or full tower cases. Graphic cards with up to 31 cm may be placed within the case by simply removing the top hard drive cage, but even with all bays in place the Prodigy offers enough space for 16.5 cm long expansion cards. This possibility of high-end components within the Prodigy make the chassis a one of a kind, potent and uncompromising Mini-ITX chassis. 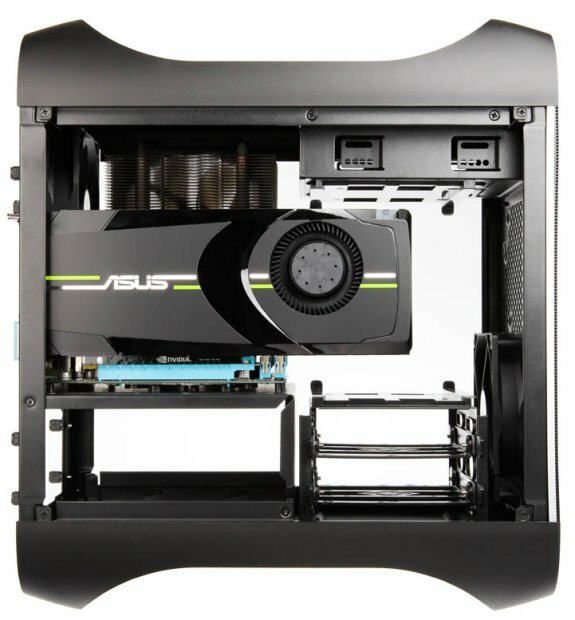 The BitFenix Prodigy will be available in “Midnight Black” or “Arctic White” from the beginning of July with a price tag of £59.99 exclusively at www.overclockers.co.uk. The cases can be found at http://bit.ly/LtX9Ie for the black and http://bit.ly/KkwbBZ for the white variant.